I am nearing completion on a double build & thought I would post the builds with a bit of the build story. A old friend of mine was out visiting from the UK. We jammed together in our student days. 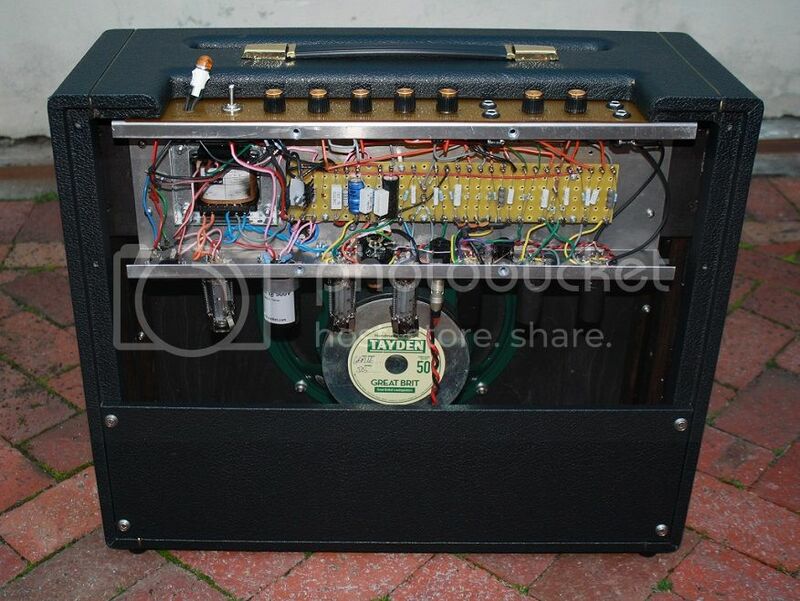 I showed him some of things I had been building, one thing led to another & I agreed to make him an amp. I can't charge him, we'll probably argue that one. I decided on an orange one for myself. I started the cabinet builds while researching & sourcing parts. Both would have VVR. For the scaling pot, I replaced the power switch with a CTS push/pull switched pot. I could only find an audio pot @1 meg. The power scaling is not exactly even& gets pretty sensitive @ 8 & more. I'm deciding whether or not I can live with it. Its possibly an acceptable quirk. I got some VVR kits but decided to use a more familiar on-the-turret-board configuration. On the orange amp I've replaced the 12AX7/ECC83's with 6n2p-ev. These are old Russian valves. I bought 14 on eBay for $20 +$11 for shipping. The shipped from Siberia & took a few weeks to get here. The "-EV" is one of the military versions. They are low noise & long life. The heaters are different & only wire pins 4 & 5 instead of [4+5] & 9. I think they sound pretty good & are way superior to JJ's. For the price, they are worth a look. You can also get adapters to make them plug&play in a 12AX7 socket. I have gotten hold of a few of these & will try them in my JTM45. On Ewald's recommendation I got the chassis, faceplates, PT &OT from ValvePower in the UK. The pilot lights are temporary while I wait for the Chicago Miniature ones from the ZA RSonline. I have been waiting > 3 months since ordering... They are very close to the original round amber indicator & I really want them. - This is my only local online order. Go figure. I've powered them up & am really happy with the sound. I'm still testing. I need to sort out the MOSFET mounting. The insulating washers I have are too large. I've also ordered bigger spec MOSFET's - NTE2377 & will stick those in when they arrive. There is one big problem: The tremolos do not work at all. The speed & intensity pots do absolutely nothing. I have been through the wring & parts a few times can see nothing out of place. My initial checking against Richies voltage chart looked OK. I'll check it again in the week. The real issue here is that I don't know what to look for. Call it inexperience. These look aaaawesome ! Congrats on a great job. 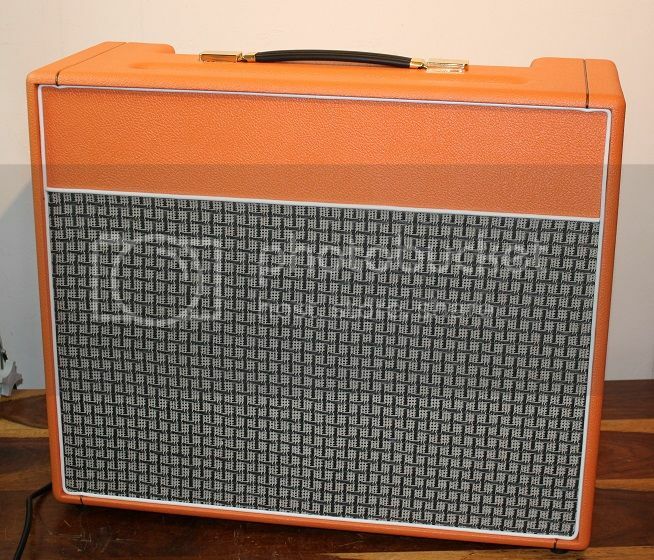 Looking good That orange tolex is pretty good looking! Keep us updated on the Trem and VVR. Iv'e never heard of Tayden speakers. Had a look online now and they look nice. Where did you bring them in from? WOW, that looks fantastic. 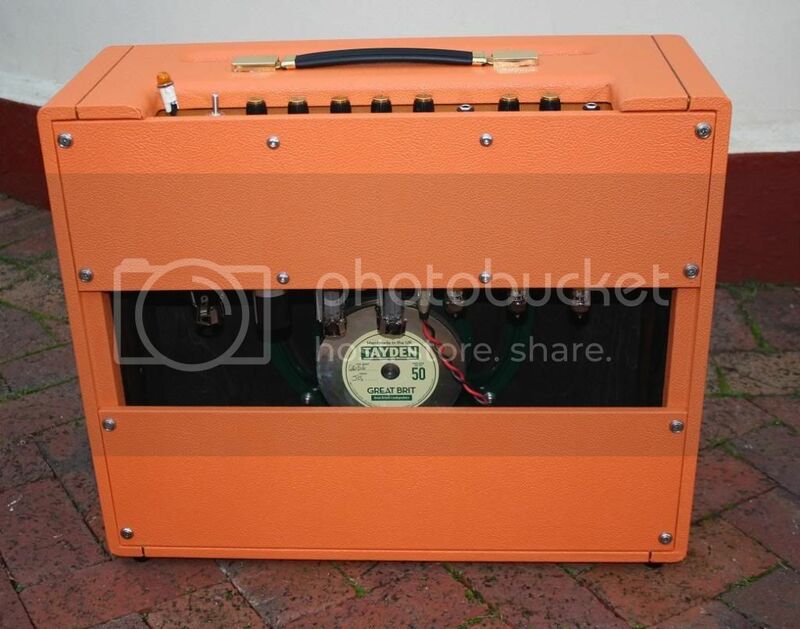 I have a pre-Rola celestion begging to go into something like this. Great job! Where did you have the cab made/upholstered ? Need to find some upholstery material myself. We look forward to the soundclips now. Psean wrote: Keep us updated on the Trem and VVR. I will do. 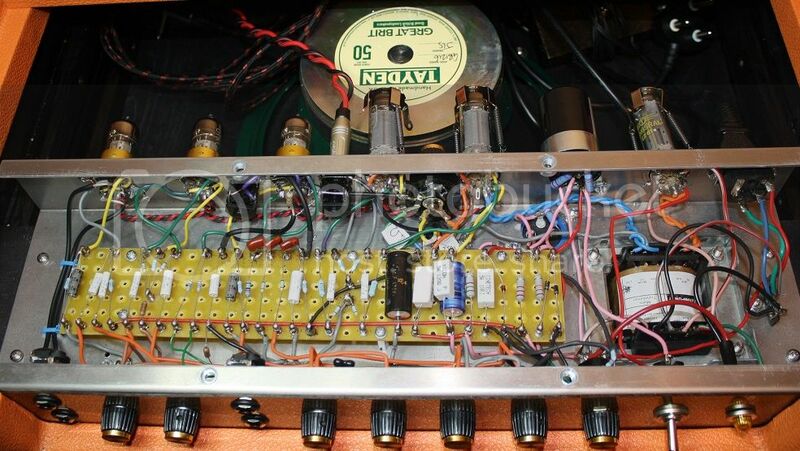 I'm hoping for a bit of advice on the forum - especially with the trem. Psean wrote: Iv'e never heard of Tayden speakers. Had a look online now and they look nice. Where did you bring them in from? It seems their reputation is growing. I don't follow this too closely, but I have seen their stuff "out of stock" a few times. http://www.lean-business.co.uk/eshop/ - where I bought. They were the cheapest supplier at the time. The shipping was much better than from the US. I also got almost 20% discount on the prices you see. I took an order of 4. - I.e. 2 anniversary G12H30's. It makes it a lot cheaper to get 4 or more at once, so if anyone wants to bundle an order, I would be interested. Its a fairly warm orange - almost like the Marshall orange. I lifted the grill cloth / colour combo from a picture of an old Marshall Artist. The pics were taken at dusk - hence the colour problem. I live in CT - I'm at work during daylight hours & it rains on weekends. 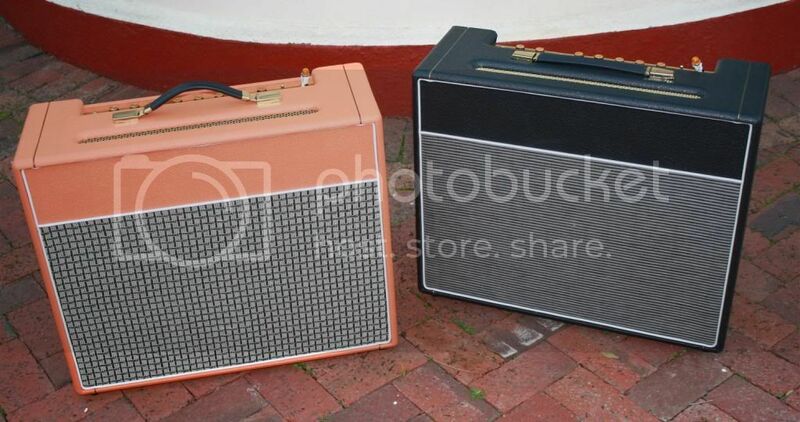 If there's interest, I'll do a thread on how to cover (upholster) an amp/cab. Its not difficult. What did you do with the footswitch? Is it permanently 'On'? If you left this out they may be in the "Off" position. 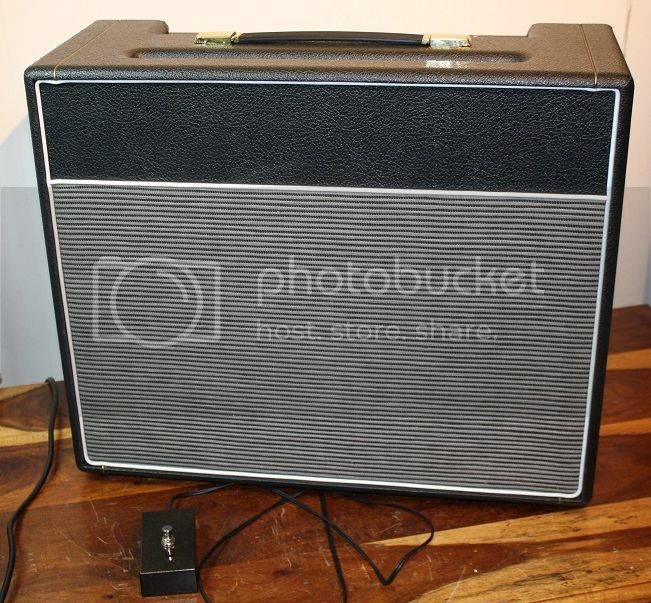 lapdawg wrote: If there's interest, I'll do a thread on how to cover (upholster) an amp/cab. Its not difficult. I'm interested. A cab is on my long-term to-do list so the info will be handy. Thanks for the Tayden info. ez wrote: Those look so great. Thanks - looking forward to you & Alan doing a test drive. The footswitch is defaulted to on, as per standard switched Carling jack. I've used switched intensity pots, and once I get the darn thing working, I will wire that switching up. That's assuming I don't lose my mind trying to work out trem problem. The components & wiring are to spec - unless I'm missing something. "I don't think I am." Famous last words - I'm in IT. I need to know what to look for with the multimeter. I haven't yet googled to a clear answer on that. I might also post on 18watt.com. Yeah, someone on 18 watt may have an idea. The Marshall Tremolo circuits are notoriously unreliable either not working or squealing madly at the slightest component value change. The VVR may be causing this. Have you tried it with the VVR on full? I did. I also had some comms with someone added a vvr in a very similar way. He didn't have issues. I need to record my v3 voltages & consider what they should be. The PT's are also running a higher output than rated. I think it was about 320 on ea. output. I'll get all this info & stick it on 18watt. You can count me in as well, always nice to see how somebidy else is doing it, one can always learn someting. Have a half 2x15" Fender bass cab to recover. Am thinking of what color to use(depending availability of course) Like it to stand out so anyhting not normal will do in this case. Ok, finally got them finished. I managed to get the "correct" pilot lamps @360v rating - same a the ones used on the JTM45 & the original 18W. I also fitted larger & better mosfets. I have got trems to work - I replaced the ceramic disc capacitors in the oscillator with 3 red/brown Xicons -you can see them in the pic below lined up on the edge of the board. I am not sure why, but that's all that was needed. I made some foot switches for the trems. I have also managed to clean up all hum thanks to a tip from Atilla. He showed me how to hook up a capacitor to make a probe. You plug it into a PC speaker & can detect/islote hum. I used this to move a few wires around & in 20 min I had cleaned up both amps. Great tip - Thanks Atilla. I been trying out a few valve combos. I was luck to find some NOS Amperex (Holland) 12Ax7's & some Phillips Miniwatt (Holland) EL84's & think they really sound great. I am really impressed with the Russian NOS valves though. To my ear they sound really good. They are long life tubes & really cheap compared to other NOS. I have also found 6V6GT & 6L6 equivalents & am keen to try them out. EZ, Singemonkey, Chris - I want you to listen & give your opinion.